Millions of Americans report allergic reactions every year with some 30,000 of those reactions leading sufferers to the hospital emergency room, according to the U.S. Food and Drug Administration. Milk, wheat and eggs are just three of the eight most common foods behind approximately 90% of food allergic reactions. Even if you don't have a full-blown allergy, food intolerance which is a lower-impact hypersensitivity to particular foods, can cause symptoms such as fatigue or bloating. For people who have allergies or food intolerance, sticking to a safe diet is easier at home. But even if you don’t have any food allergies you may simply choose to eat differently for your own health – whether that's cutting down on sugar or following a low-cholesterol diet on some (or all) days of the week. But it's not always easy to hunt down groceries and meals that can guarantee items free from allergens and preservatives, or ingredients that don't fit your diet – especially when it comes to eating out. So we researched the options and found six apps to help you more easily maintain a diet free from allergens and additives, whether you’re buying groceries, searching for recipes or eating out. Note: None of the following apps make claims to medical accuracy, and, as some products may be mislabeled or mishandled, apply caution if you have a serious health condition that arises from your food limitations. Consult a doctor if you have questions. If you already know the ingredients you need to avoid, Shopwell is an especially handy app for your supermarket shopping. Created by registered dietitians and based on USDA guidelines and peer-reviewed medical journals, ShopWell lets you scan more than 350,000 supermarket products for their nutritional content. You can set your profile to exclude added sugar or trans fats, as well as common allergens including tree nuts, lactose, sulfites, soy, sesame, shellfish and gluten, which isn't only found in grains, but may lurk in sauces and malt beverages such as beer. You can also set health conditions such as allergies or diabetes and nutrition goals such as a heart health or athletic training. 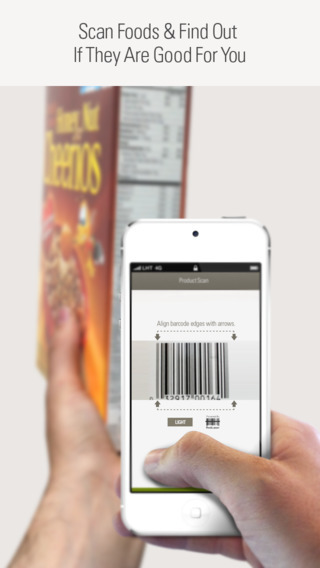 When you scan a barcode with your phone, the app scores (out of 100) how well the product matches your personal goals and needs - including whether it's an out-and-out allergen to be avoided - and displays the food's nutritional info, calorie count and any better alternatives tailored to your profile. For all our best intentions to eat fresh and healthy, there isn't always time to pick up ingredients for a home-cooked dinner. Handpick is a grocery delivery app that lets you order by “smart bundles” of ingredients sized and designed to make three meals, in categories such as Garden Harvest (lentils with spiced vegetables and chickpeas, lemon garbanzo bean pilaf, butternut squash and candied pecan salad). To score ingredients for that free-from diet, you can choose Gluten-Free and Vegetarian Bundles (prices hover around $45+shipping) for groceries to create meals such as mashed cauliflower with mushrooms or a chipotle quinoa bowl. 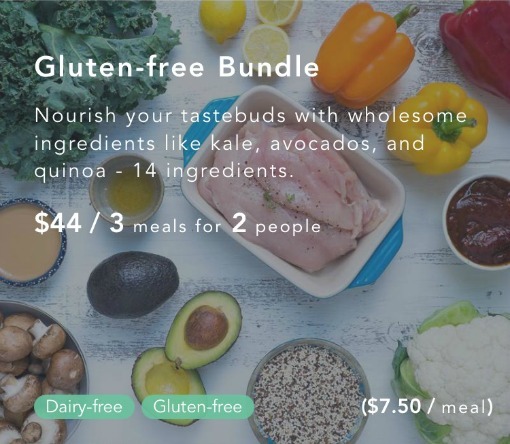 Tabs at the base of each bundle also show if the ingredients (and recipes) are dairy-free, low-carb, vegetarian or gluten-free, as well as “paleo”, the protein-heavy diet that spiked as a trend last year. You can also search for recipes by ingredient, while a trending-now tab shows what's most ordered. A daily newsfeed displays inspirational images of food on Instagram and Foodist if you're at loss for what to make. While it's relatively easy to avoid gluten when cooking at home, eating out can present a challenge – or simply be a really dull experience if a restaurant lacks good gluten-free options. Find Me Gluten Free lets you search for restaurants near you as well as by name to find those with gluten-free options, as well as those that have a dedicated gluten-free menu. Many restaurants also have user reviews that can be helpful in determining those eateries that may not have a gluten-free menu but are still staffed by people knowledgeable about allergens. 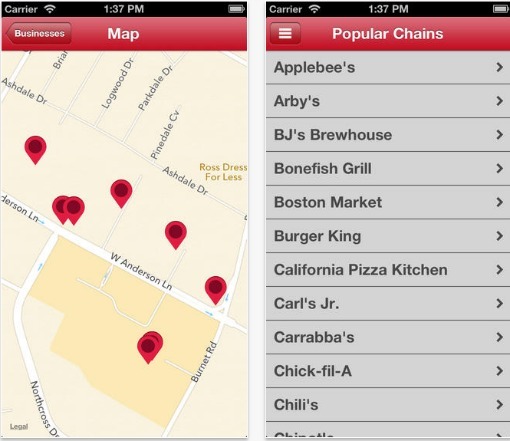 The app works in the US and the UK with a small selection of restaurants in its database for other European and Asian countries as well as Australia. Also in beta is a recipes section with notes on making classics such as crispy calamari gluten-free and substituting rice flour for wheat flour. A corollary site, Send Me Gluten-Free, offers meal kit delivery, with a monthly subscription to get gluten-free products delivered to your door. 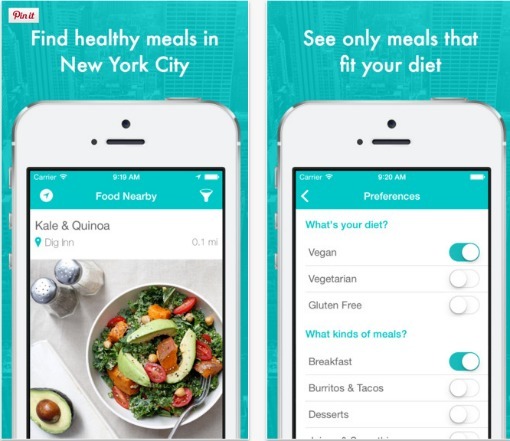 For iPhone users in the Big Apple, this app hunts down healthy meals at restaurants near your GPS location, based on options you check off on your profile. Head into preferences, and you can select from vegan, vegetarian and gluten-free diets (or leave all unchecked to eat it all), then select the types of meals you're after, from breakfast or desserts to pasta or sushi. You'll see particular dishes from restaurants that match your preferences, along with how far away they are located. More US cities are in the pipeline to be added. Constantly collecting recipes from all over the web? 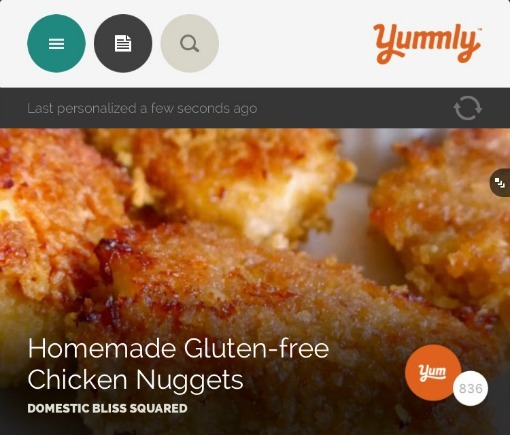 You probably already use Yummly, which can save any online recipe with options to categorize by ingredients and cuisine in multiple collections. The app also offers a great recipe feed, culled from food sites such as BBC GoodFood or Allrecipes, with tabs that also show if it's free from a certain ingredient, or fits a gluten-free or paleo diet. To really customize your feed into the perfect list of “free-from” recipes, you can build your profile to only include gluten-, dairy- and egg-free recipes, as well as exclude common allergens peanut, seafood, sesame, soy, tree nuts and wheat. Alternately, you can check broader options for paleo, pescetarian, vegan and vegetarian diets, as well as tap in disliked foods. The result is a home feed – viewable across all your devices – of recipes that suit your diet. A recent study linked certain food additives to inflammatory bowel diseases. 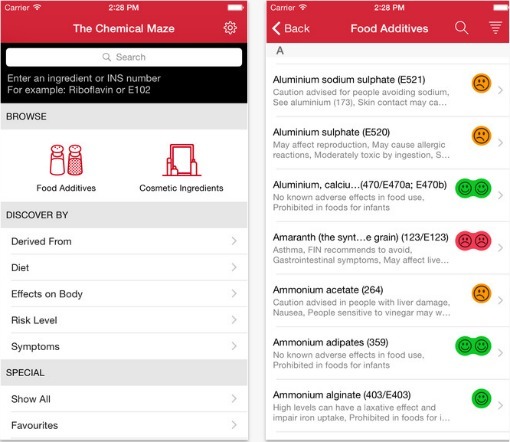 If you’re concerned about additives in certain foods, Chemical Maze-Shopping Companion, based on the book Chemical Maze, is a data base of food additives and cosmetic ingredients and their potential for causing allergic reactions or health issues. Ingredients are included by name as well as INS (International Numbering System) numbers, so that you can look up the contents of particular supermarket products to see possible symptoms as well as potential risk level to health. For example, aspartame (also findable by its INS number of 951), a commonly used artificial sweetener in diet products, is listed as possibly hazardous to health. You can also search by symptoms ranging from emotional disturbances like aggression or confusion, to physical issues such as skin ailments and digestive problems to turn up a list of possible culprits. This is more a resource tool than a snazzy litmus test for preservative-free groceries, but if you're serious about getting to know what exactly we're putting in our bodies, it's a comprehensive option. Bonus: you can look up what's in your skincare, too. Let us know what you think – and how you ensure your own “free-from” diet. While there’s good information in your article, it’s concerning that you are glossing over the differences between gluten intolerance and celiac disease. The latter is a true, autoimmune condition, and requires lifelong adherence to a completely gluten-free diet (we’re talking “zero tolerance”, here). The health consequences of gluten exposure damaging the epithelial villi in the gut are serious. Gluten intolerance, while a real medical problem, does _not_ cause this damage and does not carry with it the secondary health issues of celiac disease. (Nor does it require nearly the level of vigilance to a gluten-free diet.) Please make this difference clear - yes, it matters, and for those of us who deal with these issues, and who have to navigate products and “real life” issues like dining out, the confusion makes it harder. That being said, thanks for the writeup on apps - Find Me Gluten Free is pretty good. Thank you, TB! The number of unfortunates who actually have celiac disease and cannot tolerate the protein gluten is quite small. 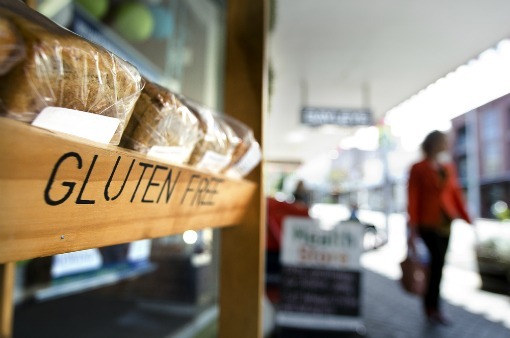 Those who claim to be ‘gluten intolerant’ fail to show evidence in double-blind tests. BTW, gluten is also known in baking as ‘wheat hearts’ or ‘wheat germ’ and is an essential binding agent in breads. Whole wheat bread is rather crumbly without additional binding agents, and adding extra gluten to the flour gives proper consistency without problems for most of us. On the other hand, gluten free removes most of the protein from flour - not that Americans have a shortage of protein. Mankind has survived for thousands of years without these crazy fads. Yesterday, pseudo-scientists demonized eggs, salt and many other foods and they have been proved again and again that those foods are not harmful, unless of course, you eat your whole week allowance in one single shot. So now, we have “gluten” or read “bread”, while the real number of people allergic is really minimal, hordes of dumb people think they have to follow the new fad. Obviously in their ignorance they don’t realize that Mankind has survived thanks to bread ever since Man learned to make bread a lot of thousands years ago. To them I say “Good Luck ! And don’t cry later of the really delicious things you are missing and please don’t bug us with your crazy food fads”. Sigh, yet another person who is railing against the attention that is this thing called gluten. As the mom of a teen who has been diagnosed with an autoimmune disease and my burgeoning awareness of the number of young people who are being diagnosed with AI diseases, we need to wake up and start looking at the additives in the overly processed foods we are being sold. (1.9 million Americans are dx with Inflammatory Bowel Disease alone). The bread that mankind has been eating for “thousands of years” and even the bread that our grandparents ate, is a far different product from the bread on the store shelves today. Read and research, but don’t dismiss the reality that our crops have changed hugely in just the last 50 years. Thank you for this valuable article for those who are more informed about inflammatory food ingredients that must be avoided if you have an autoimmune disease; yes, not just celiac. Obviously you don’t know someone who has a real gluten allergy or celiac disease. As one of the “dumb people” that has such an allergy, I can tell you it’s a real condition I discovered with a blood test. And just how does my eating a gluten-free diet “bug” you or affect you in any way? Just because you don’t understand something doesn’t make it a fad. Here’s a couple resources you may want to look at, though I doubt you will. The facts might interfere with your opinion. Missed the best app for this purpose!